Well, the first thing might be: who was Juan Rodriguez Cabrillo? He was a soldier in the Spanish army that fought the Aztecs of Mexico. He was one of the wealthiest men in New Spain. And he discovered California. Now, let’s “meet” Cabrillo and discover 5 facts about his life! Well, from the Iberian Peninsula is the one safe answer. It’s not known precisely if he was Spanish or Portuguese, though the matter is under investigative research by skilled historians and may be conclusively resolved soon. It is important to remember that Cabrillo – no matter where he was originally from – was well-versed the Spanish culture, fought in the Spanish armies, and claimed California for Spain. In 1519, Hernan Cortez took an expedition of soldiers, landed on the shores of Mexico, and marched inland, looking for land and gold. The natives thought the Spaniards were gods and, for a while, the “conquest” was “easy.” The Spanish rallied the native tribes who hated the Aztecs, making those fierce warriors angry. Fierce conflict began. Juan Cabrillo is listed in Cortez’s records as a conquistador during the conquests of the Aztecs. He was a commander of a unit of crossbowmen. Following the conquest of the Aztecs, Cabrillo continued his soldier of fortune experiences, moving south with the Spanish armies. Eventually, he settled and owned property in Guatemala, helped found the city of Santiago, and became one of the most important men in the colony. He married Beatriz Sanchez de Ortega and they had two sons. In 1542, Cabrillo left the Port of Navidad with three ship and sailed northward to explore the land above Baja California. 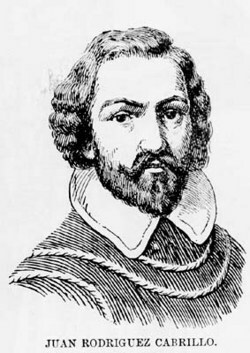 Aboard his flagship “San Salvador”, Cabrillo entered San Diego Bay on September 28th and claimed the land for Spain; he named the bay “San Miguel” (but later explorers changed the name). Cabrillo and his men continued sailing up the California coast, fighting the southward bound “California Sea Current.” They missed San Francisco Bay, but sighted Point Reyes before turning south to winter in the Channel Islands. In an attempt to rescue his men who were under attack by natives, Cabrillo splintered his ankle. The injury did not heal and became infected. Juan Cabrillo died on January 3, 1543, and was probably buried on one of the Channel Islands. Cabrillo’s men continued the expedition, though, and sailed north again in the spring. They may have reached the Oregon coast before returning to Mexico with their reports. Why is Cabrillo Significant in History? Cabrillo was the first known European to set foot on the California coast. His claimed territory for Spain would become a Spanish Colony, Mexican Province, independent republic, and a state of the United States of America. Cabrillo’s discovery unlocked mysterious California and ushered in the era of European – and later American – influence on the West Coast. P.S. Ever visited Cabrillo National Monument in San Diego?